Experts recommend a density between 15 – 20 deer per square mile, which can sustain a healthy deer herd and wildlife habitat. Since the year 2000 parks has been contracting to have deer counted in select parks using infrared technology. This method is regarded as the most accurate, offering a “snapshot” in time, and a minimum number of deer found in the park at that time. Past surveys have shown that Mt. Airy Forest has endured densities as high as 145 deer per square mile. In 2014 Cincinnati Parks contracted to have an infrared survey performed in the 3 Clifton parks. The area flown included those parks and approximately < 1 square mile around them. That survey showed 38 deer, which is about 37 per square mile, over twice the recommended density. It has been shown that densities this high cause damage to forest regeneration, wildflower survival, species diversity, and increase invasive species. Experts have shown densities over 10/sq mile result in a loss of wildflowers, over 20 we lose bird diversity, over 30 and we experience a change in forest composition. In order to assure healthy forests that future generations can enjoy, trees have to produce seedlings/saplings to take the place of mature trees as they die. 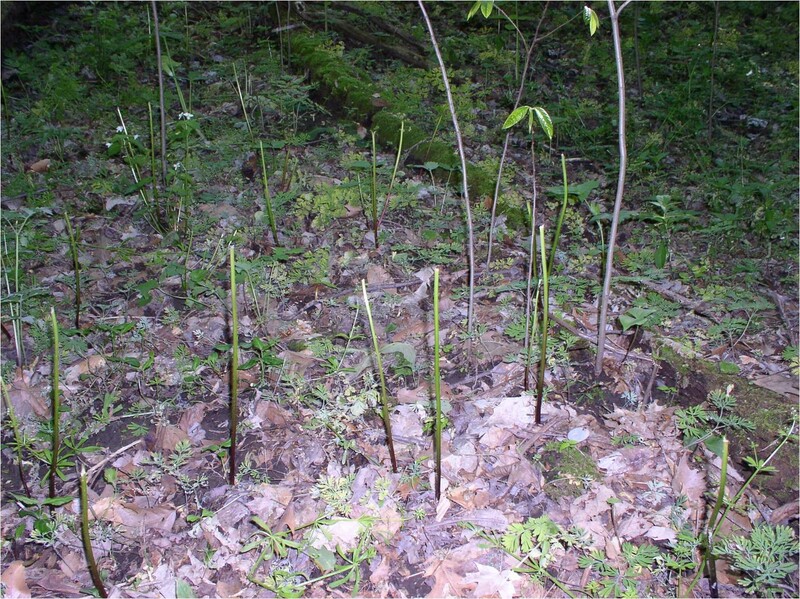 Deer browsing (eating) and rubbing damage destroy these young trees, this applies to understory shrubs as well. During 2015 deer exclosures designed to keep deer out will be constructed in Rawson Woods to study the effects of deer browsing, as well as help measure the success of the sterilization program. Detailed studies have shown that more than 50% of all forest wildflower species are susceptible to deer browsing. Continual browsing reduces the abundance of wildflowers and leaves only a few species that are unpalatable to colonize the forest floor. The effect of overbrowsing has been apparent in the deer exclosures at California Woods. Figures 1 and 2 show the difference between the protected exclosures and their unprotected reference plots. The protected trilliums are thriving while those on the outside have been reduced to stubble. When browsed yearly these plants fail to flower, reproduce, and eventually die off. Over-browsing not only effects young trees and wildflowers, there is a ripple effect throughout the ecosystem. Any wildlife that depends on these plants for food, cover, or nesting, is adversely affected. This is thought to be one of the factors in population decline for many of our forest birds. Our urban forests face many threats to their long term survival, the top two being deer overpopulation, and invasive plants/insects. Unfortunately both seem to compound each other’s detrimental effects on forest composition. 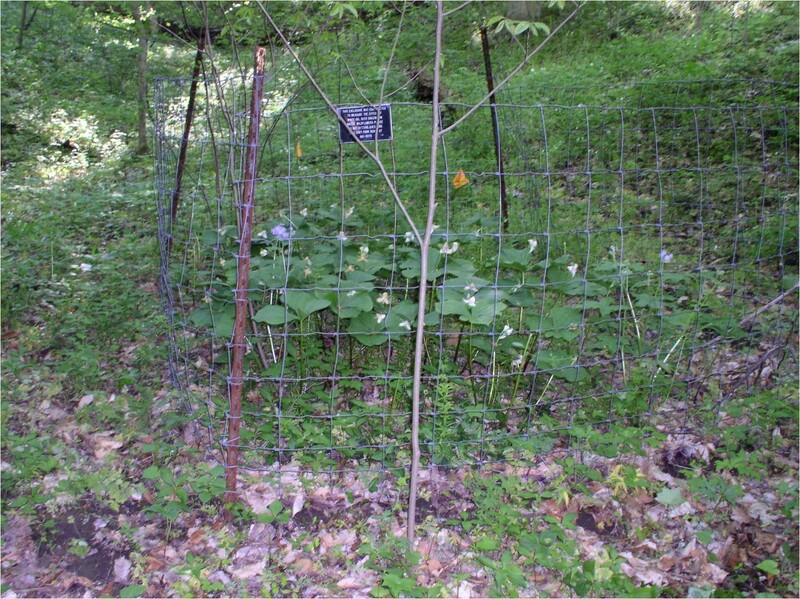 Invasive plants tend to take advantage if disturbances ranging from soil disturbance to disturbances in the canopy that allow more sunlight to the forest floor. Deer cause soil disturbance with their hooves and are a mechanism for distributing seeds or other plant parts that spread the invasion. In addition we are now experiencing an invasive insect (Emerald Ash Borer – EAB) that is causing severe tree loss and light disturbance. Add our deer problem to the EAB problem and we’re going to experience a drastic rise in our worst invasive plant species. All three of the Clifton parks will benefit from a reduced deer herd for the reasons mentioned above; however there are also reasons specific to those parks. Mt. Storm will experience a loss of approximately 3 acres when I-75 is widened. Native trees and wildflowers will be lost as well. As part of the restoration parks is requiring that ODOT plant native prairie grasses/flowers, and trees to replace those lost. A reduced deer herd will help those plantings be successful. Rawson Woods has a high population of ash trees that will be lost due to Emerald Ash Borer (EAB) as well as good wildflower populations. Some of these wildflowers are descendants of the plants that were rescued from Mt. Airy during construction of I-74, and parts of the U.C. campus. Reducing the deer herd will help their survival as well as making any invasive plant removal more effective.